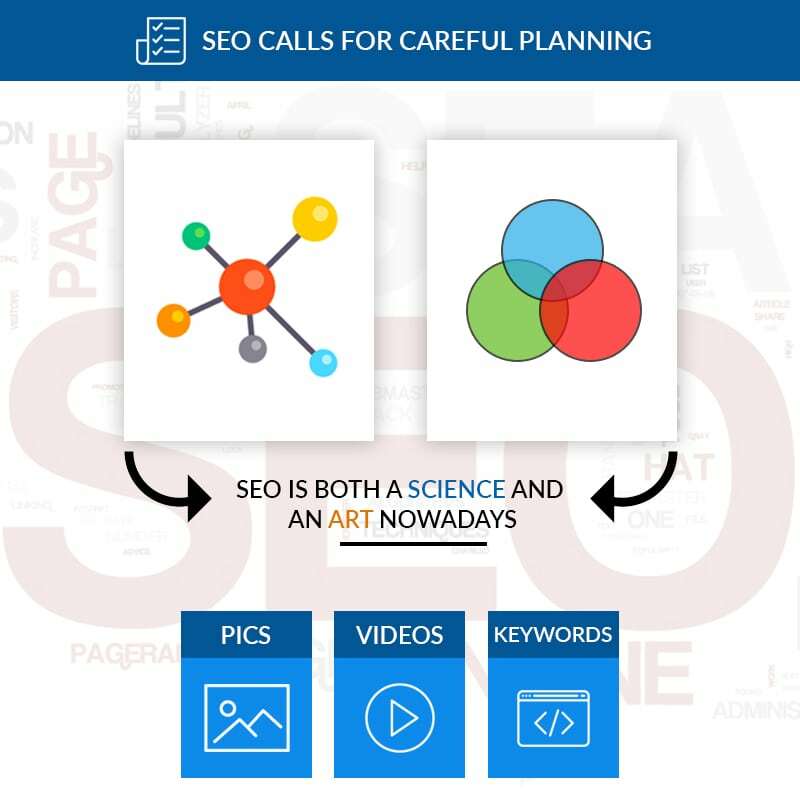 SEO is both a science and an art nowadays. Real pros know this as it’s not just some technical things you have to do, you’ve also got to be creative and innovative to better your chances. It’s the balance between the two that brings solid results. You have to have patience, first and foremost. It can take weeks or months to see significant results, but if you keep at applying the fundamentals you’ll gradually show up on the search engines and gain more prominent rankings. Only in the case of extremely unique and proprietary content that goes viral will you see a stellar boost in traffic but that isn’t the everyday situation for the majority of webmasters and marketers. Following the basics means knowing how a website should be constructed and optimized. Just slapping up some keywords and links isn’t enough. It’s ‘how’ you apply these that is most important. You need to follow sound strategies and having a site that is clearly laid out properly with well written copy, pics, videos, all tagged well with keywords, keyphrases, and keygroups included in variations is how you establish the best SEO basics. Being unique doesn’t mean tossing out the sound and solid SEO techniques and practices. It means you put your own special blend on your posts and content and layout. Let people know it’s you and your company that are the primary targets as well as the goods and services you offer. Never let an opportunity slip by to toot your own horn, but do so in a unique and creative way. Add as much about you and your location as well so you tackle more than one keyword at the same time. For example let’s say you own a pet food store in Boston, Mass. Well instead of saying “The best pet food store in Boston, Mass!”, you would say, “I’m Joe Smith, owner of Joe’s Pet Food Store, the best pet food store on the corner of Apple street and Pear street next to the statue of Thomas Jefferson at Liberty Square!”. See how much more data you put in there and added a bit of humor too? You’re covering who you are, what your store does and where it is located with two references. This better helps you to take advantage of SEO and Local SEO in one swipe. Make content social media engaging. What this means is put up content people will want to comment about, share, and like. If you’re the pet food store owner, then take video and pics of people bringing in their pets or of pets around town doing funny things. These videos and pics can go viral and if you’re talented enough do some memes for your social media pages. Posts like this will bring more engagement by the audience and they’ll spread your name far and wide. Use statistics all the time. You can’t know what is effective if you’re not monitoring what is going on with your site via statistics. Statistics will show where the best traffic is coming from and why. This allows for better fine tuning on your part to provide the content that is popular to your surfers and what isn’t. Doing this will definitely bring in more solid results overall and is a very responsible practice not to be underestimated. Don’t give up. Keep your site active with new posts and engage with the public via your site and social media. It will show Google that you are active and not some static spam site. It shows you’re offering a service and value of some sort as the number of backlinks from a variety of sites and those valuable authority sites puts a spotlight on you. Remember, time and patience, creativity and sound application of established methods and you’ll be standing on solid ground.